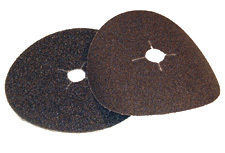 Our heavy duty edger discs are made from a combination cloth and paper material for grits 12-24 or heavy weight paper for grits 36-120. Discs have a 7/8" center hole as standard, but 7" discs can be special ordered with a 5/16" arbor hole. All of our products are Made in USA from the finest quality materials. Some of our floor sanding customers use blue alumina zirconia resin fiber discs in place of these paper discs. Click Here for alumina zirconia discs. Contact us for 7" discs with 5/16" center holes.